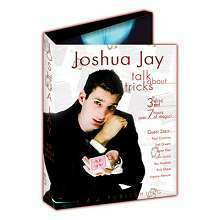 The concept is simple: Joshua Jay writes the critically-acclaimed "Talk About Tricks" column every month in MAGIC Magazine, and this set is the column come-to-life! Every month, Joshua Jay features original effects from the world’s greatest magicians. There are hundreds of fantastic tricks buried in those pages. Now we can finally see how great these tricks look at performance speed. From close-up to parlor, from cards to Q-tips, from money to mentalism, from easy to difficult, this collection boasts over seven hours of the best magic ever published in "Talk About Tricks." Better still, many of these effects are performed live by their originators. See magicians Felipe Abreu, Paul Cummins, Joel Givens, Rune Klan, John Lovick, Raj Madhok, Rick Maue, Francis Menotti, and more, all performing and explaining their creations. You’ll also see magic created by Eric Buss, Bob Farmer, Martin Gardner, Larry Jennings, Ed Marlo, David Parr, Gaston Quieto, David Solomon, Gregory Wilson, and dozens more! This box set boasts over seven hours of close-up magic from the industry’s leading thinkers. Hosted by magic performer, author, and lecturer Joshua Jay, you don’t want to miss out on the most comprehensive, exhaustive DVD release of the year!